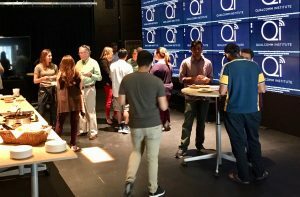 Research IT Services (RITS) representatives were delighted to attend the recent Qualcomm Institute (QI) mixer on Thursday, October 12, 2017, where they had an opportunity to share their work with a group of about 50 attendees – researchers, staff, and others affiliated with the QI. 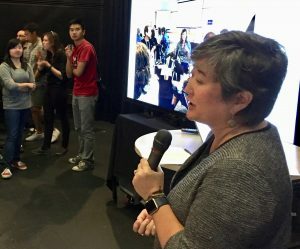 Assistant Director of RITS Claire Mizumoto highlighted some of the benefits available to researchers through her unit. RITS offers free consultation and facilitation services to researchers across campus, connecting them to appropriate technologies and resources specifically chosen to satisfy often complex criteria and regulatory requirements. In addition, the RITS team is involved with various pilot projects, most recently the Amazon Web Services (AWS) Research HIPAA Cloud environment and the AWS Cost Optimization Program. These projects address gaps in services currently offered on campus and to aim to reduce costs to researchers by adopting a consolidated billing model leveraging volume purchasing discounts. Faculty who are preparing grant proposals may be interested to learn that the team’s two System Integration Engineers are available to work with faculty researchers in the development of demos and proofs of concept that can help strengthen funding proposals. Have questions? Want to learn more about how Research IT Services can help you?